This section will look at some of the more popular services for genealogists in the UK. I’ve ben reluctant to do this, as the providers are continually changing what they provide! However many people have asked me for my opinions on the different providers, so this is my personal view. You should do your own research before spending any money! This part of the course is a work in progress -and not yet finished. 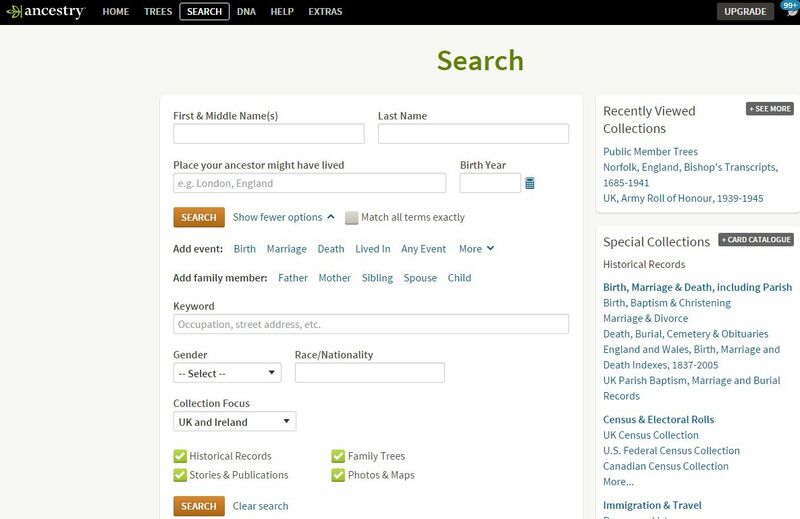 Ancestry is the UK’s largest family history site. It’s owned by the largest for-profit genealogy company in the world. Different subscriptions are offered. There are also Special Collections. Findmypast is a privately held UK-based online genealogy service owned by British company DC Thomson. There is a wide variety of census, directory and historical record information available. Although it is possible to search their indexes for free, a payment or subscription is required to access the full data. Genes Reunited (was formerly known as 1837 online) is a sister-site to Friends Reunited. It’s cheaper, but doesn’t have all the features that Friends Reunited has. The Genealogist is an easy to use service, run by Genealogy Supplies (Jersey) Ltd which is part of S&N Genealogy Supplies. Different services are provided for different subscriptions. The main features of the the different services is shown here. Roots UK is part of S&N Genealogy Supplies and offers a cut down version of the services of The Genealogist. Records include the electoral roll for London in 2005; birth, marriage and death index records for England & Wales from 1837-2005; and census transcripts for the whole of 1841, 1851, 1861, 1871, 1881, 1891 & 1901 (England & Wales). Standard searching is free, viewing a full record uses credits the first time you view it.